This is it guys, the last of the Maiden Lane stories! It is officially time to start crying, whimpering and going into withdrawal mode. Sara St. John really rather loathes rakes. The self-satisfied smirks. The sly predatory gazes. Oh, and the constant witty banter rife with double meaning. But in the spirit of the season, she'll welcome this admittedly handsome viscount into her home. 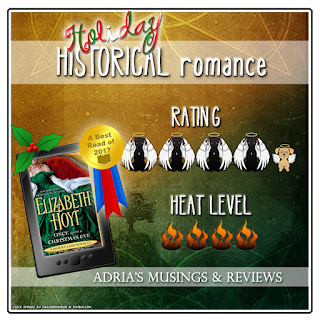 But as the snowstorm rages, the Yule log crackles, and the tension rises, Sara and Adam find themselves locked in a fiery, passionate kiss. If love is the true meaning of Christmas, it's the one gift this mismatched pair can't wait to unwrap. What’s it About? While on their way to a relative’s house to spend Christmas, Adam Rutledge the Viscount d’Arque and his grandmother end up with a broken carriage wheel. They’re then forced to take shelter with the St. Johns and Adam is forced to play nice (sort of) with Sarah St. John, who despises rakes with a passion. But with the Christmas spirit in full swing, these two end up spending a lot of time in each other’s company and finding out that what they thought they knew about each other wasn’t entirely true. Overall reaction to the story? 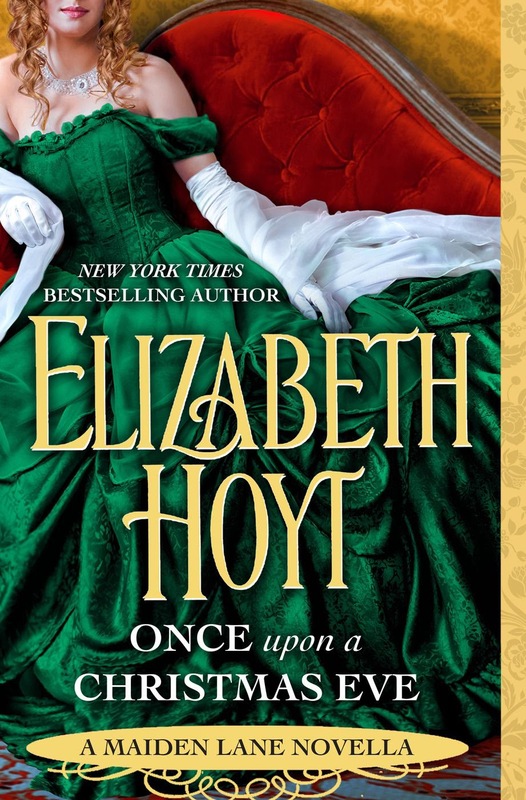 Elizabeth Hoyt doesn’t hesitate to bring her signature brand of raw passion and heart to the holiday season in Once Upon a Christmas Eve! 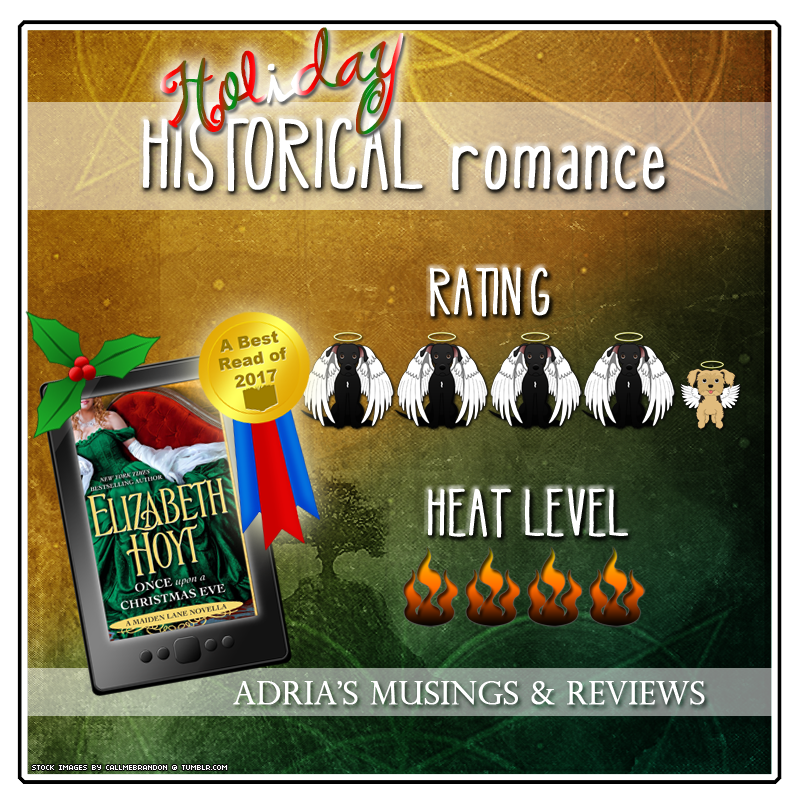 Hoyt has seduced readers for years with her uniquely crafted Maiden Lane series and though this holiday novella is the last story in the series, it brought a smile to my face. Adam and Sarah are familiar faces to longtime fans, Adam, the Viscount d'Arque first appeared in Thief of Shadows as a supporting character, and Sarah is the sister of Godric St. John, the hero of Lord of Darkness. These two are as mismatched as they come, Adam is a jaded, Christmas hating rake, and Sarah is a fresh, rake hating woman. They can’t be in the same room without Adam trying to make Sarah angry and Sarah responding with a scathing insult. Which is what made them such a lively pairing for this novella! I admit I never gave Adam a second thought after he was introduced, not because he wasn’t interesting but because there was no hint that he would ever get his own story. I had hoped Sarah would though because honestly the whole St. John family is interesting. I would have never thought to pair her with Adam though which is why this novella works so well. Sarah is usually so calm, so dependable, and unflappable yet with Adam she was feisty, fierce, and so alive. And Adam was the predictable, unrepentant rake with a hidden soft side but with Sarah he was fun, charming, and just better with her. They forced each other to think outside their comfort zone and I enjoyed their verbal sparring as much as I enjoyed the physical chemistry between them. I really am going to miss this series and the characters that I’ve grown so attached to over the years, but I’m glad that we got Adam and Sarah’s story and that it’s a holiday romance. Click It or Skip It? Click It. 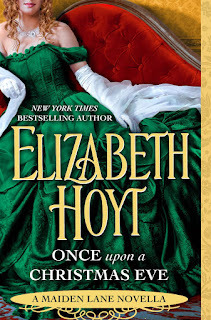 I’m so sentimental about this series ending and Once Upon a Christmas Eve is such a fun novella with two characters who don’t seem like an ideal couple on the surface. 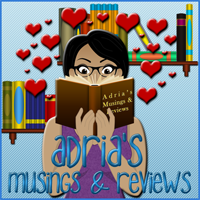 Interview with Author Errin Stevens! Tuesday Jams: My Sister Made Me Do It. Top Ten Tuesday: Book Places!